Boulder’s Number One Dining Spot on a Wednesday Night? From May to October, the downtown Boulder Farmer’s Market is hands down, the Best. Playdate. Ever. The night to GO OUT. Appreciate aesthetic beauty. Of the edible and the human variety. Where else can you get all these playdate perks at one venue? Join me on a virtual tour through last week’s Wednesday night market. It’s 5:00 p.m. and a fresh rain has cooled the air. I meander slowly down the main drag. Throngs of locals are sauntering, sampling, smiling. Sharing, sipping, savoring. It’s July, and my scanning eyes capture corn, flowers, peaches, and ice cream. I spot new vendors this year, selling creative, nicely-branded offerings. I opt to try three new foods in the ‘ready to eat’ category. Course #1: Bring on the gluten! Why even try to resist the generously sized, salt-covered, artfully twisted Bavarian pretzel from Styria Bakery. It’s nothing like the tough, chewy pretzels you find in the Big Apple or your local sports arena; this pretzel bites off nice and smooth and imparts a lightly salted flavor that melds perfectly with the slightly sweet dough. At $3, it’s a super deal; share it and still have room for…. Course #2: The Absurdly Good Stuffin Muffin. This homegrown, absurdly good Thanksgiving-harkening ‘handheld feast’ is like nothing you’ve seen come out of grandma’s kitchen. We’re talking year-round stuffing in a savory muffin format, with ingredients like sage, parmesan, pancetta, cranberries, cornbread, sausage, and names like Norman Rockwell and Peppy Diablo (the latter a veggie, gluten-free option). This business screams creativity, and it’s counting on locals wanting a portable, filling, affordable meal that reminds them of home, family, and love. Have a taste next Wednesday and see what it reminds you of. (Disclosure: My fellow food blogger Allan Parr founded Absurdly Good). Course #3: Feelin’ kinda spicy from the Peppy Diablo’s green chiles, I needed to cool my jets. Fior di Latte gelato was the obvious solution. I’ve travelled in Italy since my 20’s and have savored way more gelato than Elizabeth Gilbert (author of Eat Pray Love) ever did. Fior di Latte is the real deal. Giulia Licht (co-founder and gelato chef from Venice) is a delight; she proudly shared that they supply numerous local restaurants (including Il Pastaio, Bacco Trattoria & Mozzarella Bar, Bitter Bar, and Via Toscano in Louisville) and plan to open a retail café/bakery/gelateria on Boulder’s Pearl Street in spring 2014. 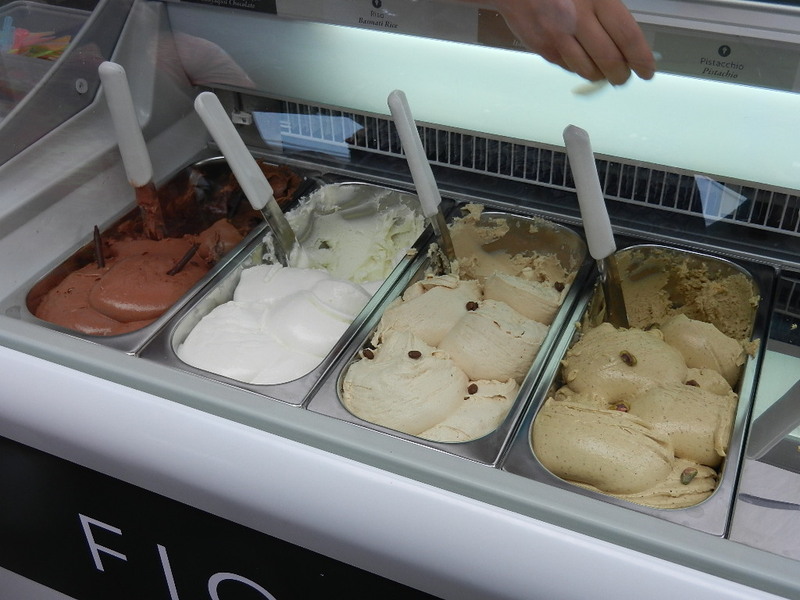 Fior di Latte chooses seven flavors from a large flavor palette every Wednesday for the market. Giulia and her co-owner husband Bryce start making up batches at 5:00 a.m. and typically sell out before 8:00 p.m. each Wednesday (any extra is 50% off until it’s gone, because “day-old gelato is not gelato.”) Best flavors this week? Pistacchio, Caffe, and Melone (canteloupe). Course #4: Top off an unforgettable evening with an aromatic cuppa Silver Canyon Coffee, a family operation and long-time market presence. Until I tried Silver Canyon, I couldn’t drink a non-espresso coffee drink (most drip is too weak and watery). You can’t miss the aroma when you walk by, so bring your own travel coffee mug and give it a try (samples available). Enjoy them Saturday mornings too, where Julia’s smiling face will greet you warmly. 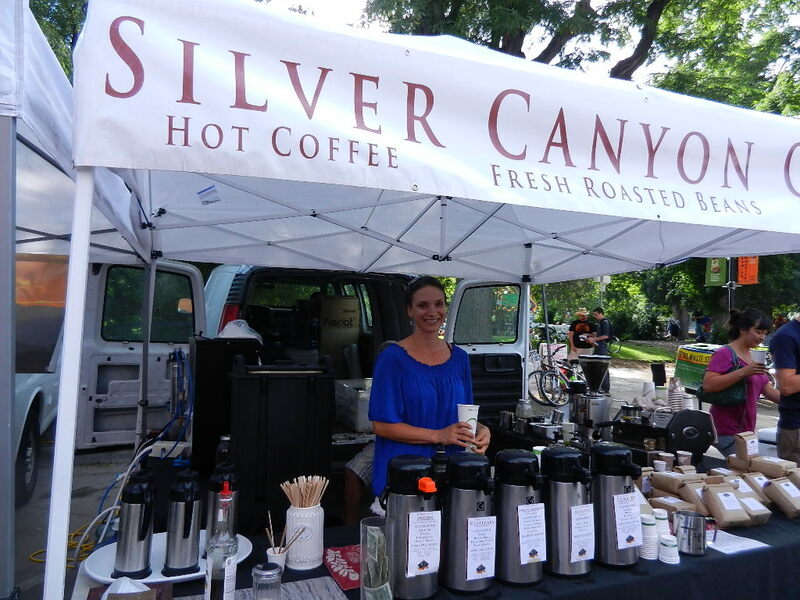 The Boulder Farmer’s Market season runs every Wednesday night (4:00 to 8:00 p.m.) through the first Wednesday in October, and Saturdays through the third Saturday in November (8:00 a.m. to 2:00 p.m.).